We kicked off our 100 Acts of Kindness Challenge this week and sent out the Week 1 Challenge in our kindness newsletter. It is not too late to subscribe to the newsletter and join almost 1,000 other families, teachers, grandparents, and friends and spreading kindness. Go here to sign up. My co-host Megan is sharing some Hug Coupons for Kids to Make! Valerie at Inner Child Fun has 5 Simple Ways to be Kind to Your Family that you should check out. 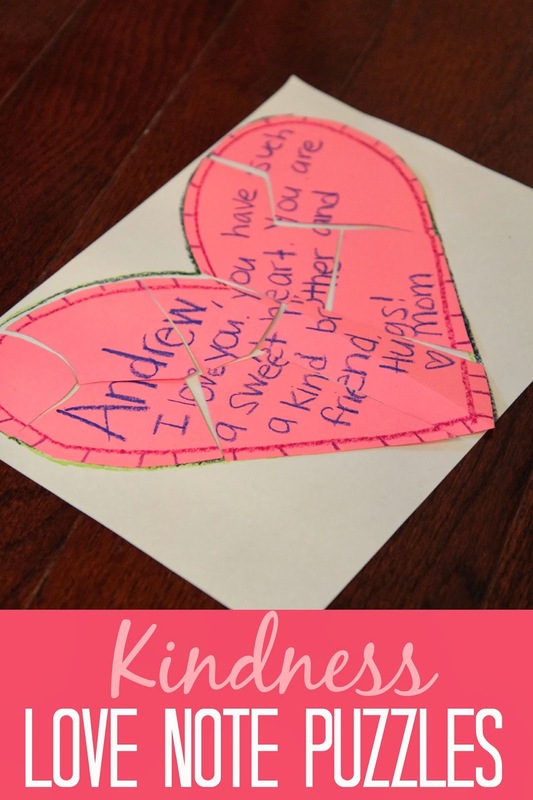 This week we are focusing on being kind to our families so we decided to write little love notes to one another and turn them into kindness puzzles. Not only were the puzzles adorable, but it was also a lot of fun to work together to build them. 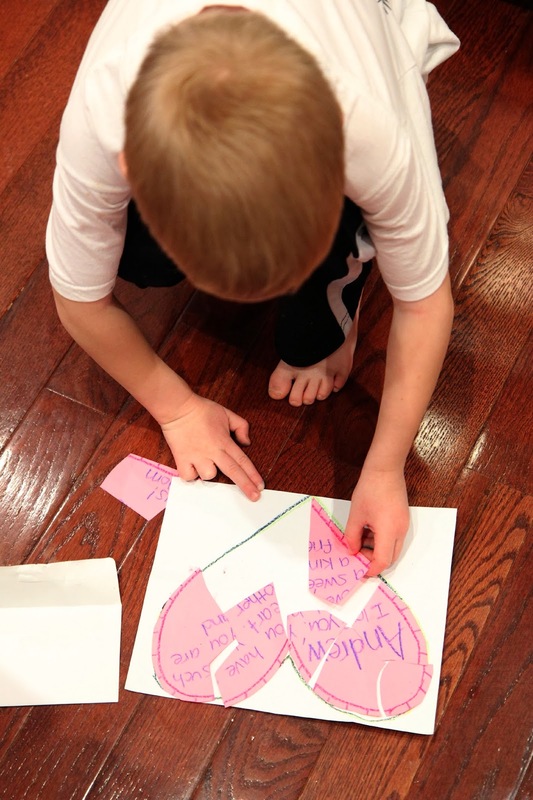 To make our kindness puzzles we started by cutting the paper into the desired shape (we used hearts today). 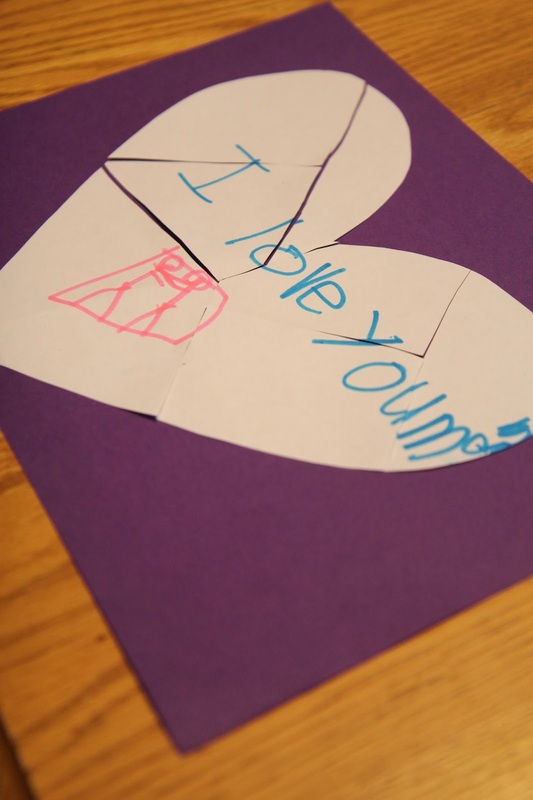 Then we wrote nice notes on the shaped paper and then cut the paper into puzzle pieces. My 3-year-old just drew pictures while my 5-year-old wrote his note. Lastly we put the kindness love note puzzles into envelopes, sealed them shut, and gave them to family members that we love. After we exchanged puzzles, we sat down and put them together. It was so sweet to read the special little messages included in the kindness love notes. Tomorrow in our newsletter we'll be sharing ways to spread kindness to extended family members. Yesterday we shared ways to be kind to siblings. Don't miss out on either. Make sure to sign up for our newsletter. 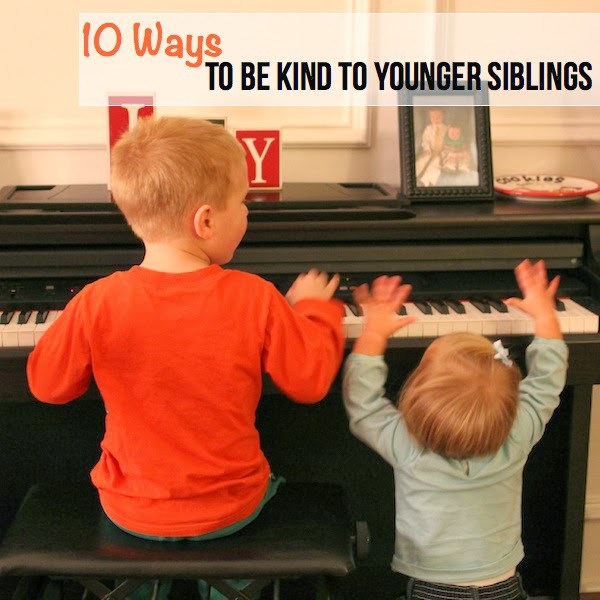 What are some simple ways that your kids show love to their siblings? You? Their grandparents? Other family members? I'd love to hear what kind acts you've been doing as part of the kindness challenge. My kids had a blast decorating our bedroom door with hearts and cute notes the other morning. I am sharing some other simple kindness acts from time to time over on Instagram if you want to come and follow me over there too. I also have an entire pinterest board with acts of kindness. Can't wait to see what kind things you've been up to! If you want to be more kind to your kids and feel more effective as a parent, Toddler Approved and Positive Parenting Solutions are hosting a FREE webinar to help Get Kids to Listen Without Nagging, Reminding or Yelling. You can RSVP here to save yourself a spot. Space is limited. Awww!!! I love this, Kristina. Can't wait to make one for my kids. Sharing! Oh my gosh, I LOVE this! We are definitely doing this!